Well I will say a few words about Richard Peterson. 1st of all everybody called him Pete. I rode with him many times. He was a straight forward kinda guy. Never had to guess about what he was thinkin. He came right out with it. If you had a problem with your bike he was always willing to help. He was a good father to his children. His Daughter was on the back of the bike when he was killed. She is not handling that very well from what I hear. She had begged him to ride the bike that day. 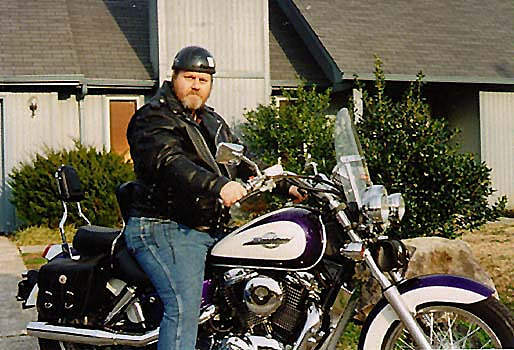 Pete was a true biker. Would ride across town for a cup o coffe or cross country at a moments notice. When you ride the Trial of Tears there are TOT signs every mile along the way. Pete was the driving force behind those signs. Evey time I see one I think of him. He did 2 tours of duty in Vietnam. He also had lung cancer and beat it a year or 2 before he was killed. Pete was not a hot rod rider. He took it slow and easy. If you were riding fast he would just keep going at his choosen pace. In other words he was one of your more safe riders. The day he was killed he had taken his daughter to get her prom dress. As he was heading home there was an elderly lady pulling out of a gas station. She didn't look before she pulled out. She hit Pete broad side. His daughter was knocked off the bike. He stayed with the bike and went acoss 3 lanes of traffic into oncoming traffic. Was then hit by a truck and killed instantly. The old lady has never been charged with anything. No breath test no nothin. She said dhe didn't see him. Witnesses say she didn't even look. Just barreled out into the road. There is a lot of legal stuff going on now with the insurance company. Maybe they will settle. As bikers we must stand up and raise hell when one of us is hit and the cage driver says "I didn't see him" This is much too common. My feelings are if you can't see a 250 lbs man on a 700 lbs bike with bright lights on then you can't see a person on a bicycle or someone walking and you don't need to be driving. He is missed by all of us who knew him.